LG has announced the arrival of its first-ever 1GHz smartphone – the LG eXpo, which comes packing a optional pico projector add-on. The eXpo features a 1GHz Snapdragon CPU, a 3.2-inch touchscreen, 5MP-megapixel camera, a microSD slot, and a removable projector courtesy of Texas Instruments. While it's not quite an integrated projector phone as Samsung is promising, it does point to which way the smartphone market is moving, now that cameras and camcorders on handsets are now ten-a-penny. Although the eXpo is only slated for a US launch at the moment (AT&T has snapped up the distribution) the phone has also been announced as the LG IQ in Canada, so it will be interesting to see what catchy moniker the company give the device when it eventually reaches UK shores. 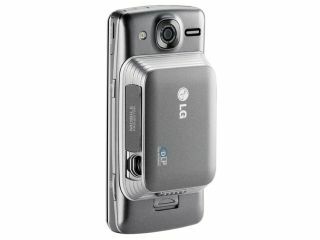 The optional pico projector allows projection up to a distance of eight feet, with LG hoping that the addition of the technology makes the device into a "future-proofed smartphone." Other features include Smart Sensor finger-print recognition and support for up to 16GB memory, via microSD. Out in the US 7 December, the LG eXpo will set you back $199.99 (plus contract) and the optional pico projector add-on is $179.99.